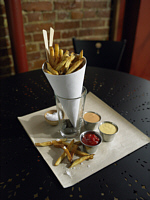 If you’re a french fry fan you NEED to get to Duckfat. Located in Portland, Maine it’s a small upscale sandwich type shop located just a few blocks from the Old Port area. Duckfat serves up lunch and dinner 7 days a week. Soups, sandwiches and THE most amazing french (actually belgian) fries around. Cooked in duckfat, they are the perfect color and crispness. Served with a choice of sauces, but definitely try the truffle ketchup. Wine and beer served too. And don’t miss the milkshakes!